Having an outdoor playset at home is a great adventure for the kids. It allows them to be able to get outdoors and use up some of that energy that they build up. Playsets at home are no different than the playsets that you use at the park. The first priority is safety and the next is the level of fun. When planning to purchase a playset for your backyard, both of those priorities have to play hand in hand. It is like a fine balancing act that has to come together at just the perfect levels. 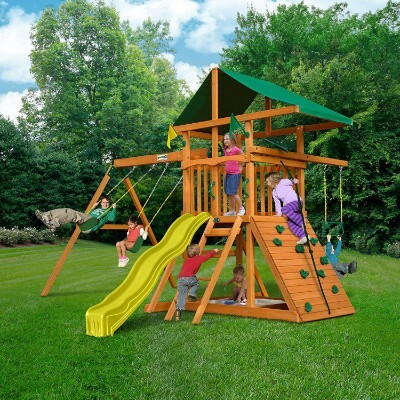 It can be a challenge finding all the best outdoor playsets in one place to compare. So we have done that part for you. We have done the research, created the list, and now it’s your turn! Fun in the sun for the kids shouldn't mean hours cramped over research for parents. We've scoured the market for the best outdoor playsets and are proud to present them to you in our brand new format! When we updated this page we made sure all products were still available and met our criteria to be on a best list. We replaced a few items with higher rated and better reviewed products. We also made sure all information on the page is current and correct. The last thing we did is expanded the list so that you have more choices to pick from! Boys and girls in the age range of two to six years old will love spending time in this clubhouse. There are plenty of activities to keep kids busy for hours. Play sets, such as this, give kids the opportunity to use up all of that bursting energy. This item features a skylight bubble, dual windows, and a functional steering wheel. 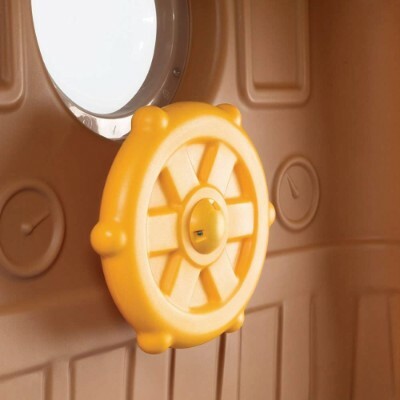 Kids can imagine they are piloting a ship at sea as they spin the bright yellow wheel inside. There is a tunnel underneath the clubhouse where children can hide and crawl through. A fabulous bridge joins the clubhouse and the lookout tower, allowing kids to move from one section to another of the clubhouse. For activities, there are two slides to glide down, plus a wide ladder with grip handles to climb safely. The steps are easy to climb, and they are skid-free. 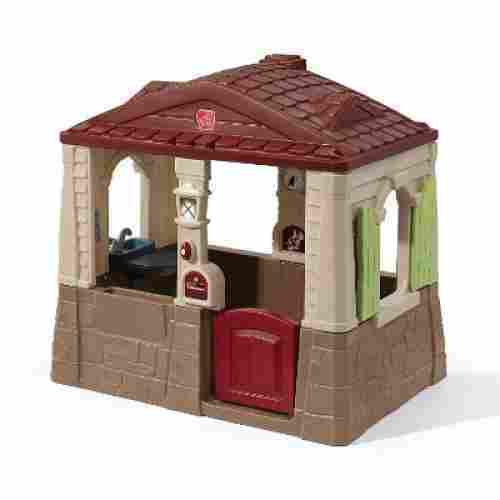 The various colors of this playhouse are quite inviting to kids, and their enjoyment can last for several years with this product because of its durability. Clubhouses like this one are perfect for children when they are active and even when they are not. Two sheltered spots provide a quiet place for kids to relax and just enjoy some leisure time. One child or many can play in the Clubhouse Climber because there is so much to do and plenty of space for everyone. It's simple design makes it very inviting for all small kids. Some reviews state this product is not durable. Pieces may not line up to be an exact fit. 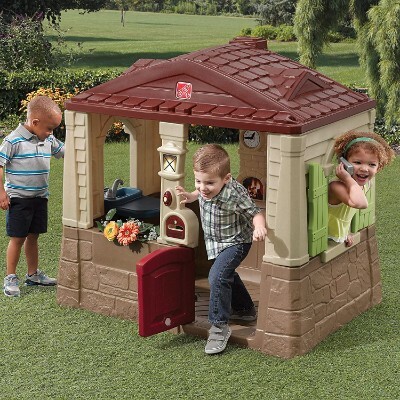 The realistic elements of this playhouse will stimulate your child’s imagination while also allowing them to make connections to the real world. 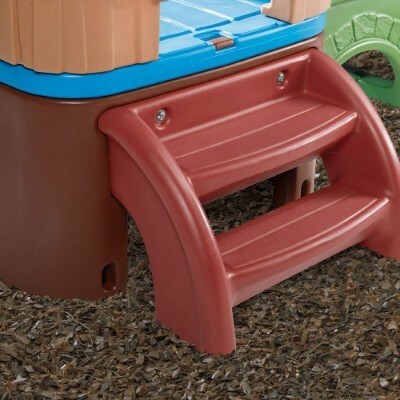 With this playset being over four feet wide, your child will have plenty of space inside to play with their friends. Composed of plastic, it is durable and sturdy so you won’t have to worry about it tipping over while your child is playing inside. Excellent for make-believe play, the Step2 Neat and Tidy II Playhouse has an open design so parents can still see what kids are doing inside. It features a fully operational Dutch door and shutters and comes complete with kitchen seat, built-in shelves, faucet, fireplace, and play phone. This playhouse comes with drain holes on the floor to allow for instant removal of water especially if your kid will decide to put real plants in the flower box and water them during play. It fosters creativity and imagination among children. It teaches them about the different parts of a house and how to keep it neat and tidy in a very fun and enjoyable way. It really is a good way to stimulate early homemaking skills. As they press the doorbell and open the swinging doors they will be increasing their fine motor skills. 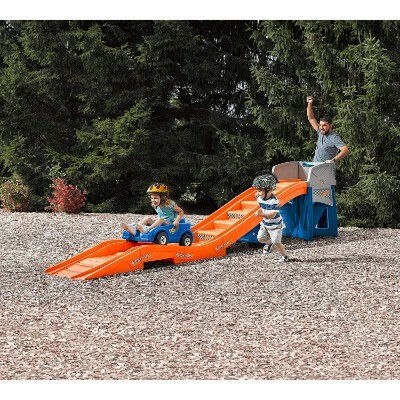 This heavy-duty playset offers years of solid play use for kids of many ages. The playset has been tested and exceeds the safety standards set for the industry. 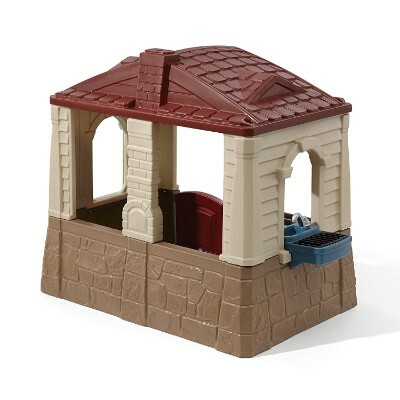 This playset will offer hours of endless entertainment for many years to come. 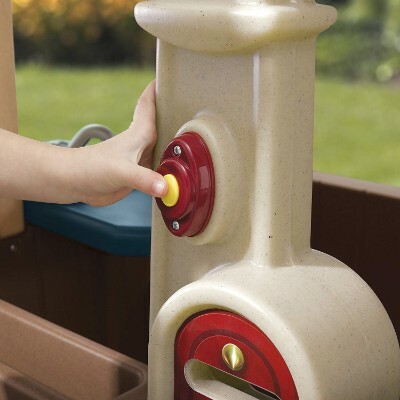 This playset is designed to last many years with its solid wood design. It features 4 x 4-inch posts and the beam the swings hang from is 4 x 6 inches. All of the wood used to construct the playset is cedar which is naturally is resistant to rot, decay, and repels bugs. All of the swings, the slides, and other plastic materials are UV-protected plus the chains have been covered with plastic to prevent little fingers from being pinched and on sunny days prevents the metal from heating up. The total capacity of the entire playset is 800 pounds. That means a lot of kids that can play all at once. 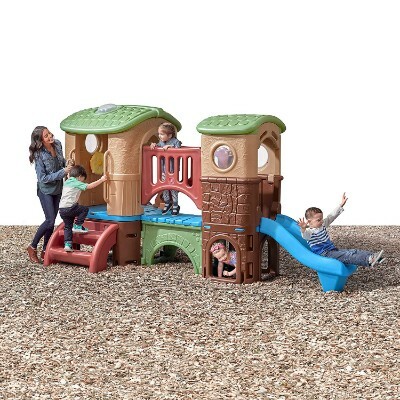 The playset has many play activities like swings, a slide, climbing ladder, rock climbing wall, and hanging bar for a lot of fun. Swings are often one of the things that draw children to a playset but can also be one of the things that they need help with from an adult. The company that created this playset has gone the extra mile with the swing construction and safety. The plastic used on the seat is UV-protected which helps prevent it from heating up and the chains are wrapped in that same plastic which also prevents little fingers from getting pinched. This is a great playset for multiple children to enjoy at one time. Between the slide, swings, and playhouse, they will find countless adventures to go on. 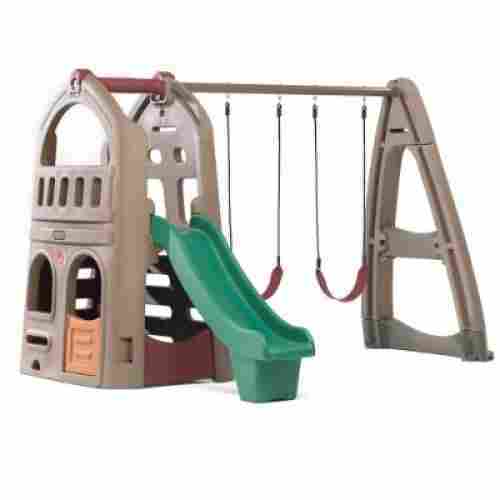 With enough room for everyone to play, this playset includes both a climber and swinging addition plus a slide. 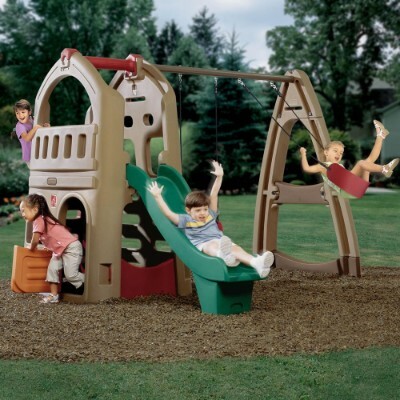 It is the perfect playset to transform your boring yard into a playground that is fun for everyone. On one side the playset offers a swinging area and the other side is a ladder below which is a playhouse. The playhouse has two levels, below the platform for the slide and the area that allows children to enter the platform and exit down the slide. 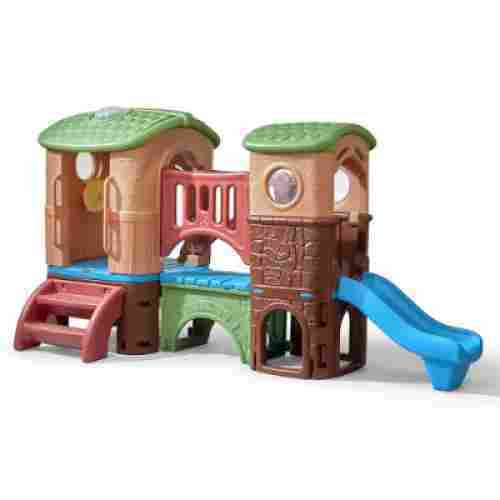 Huge playset that offers lots of items and space for the kids to all play on together. The swings are a great addition to this playset. 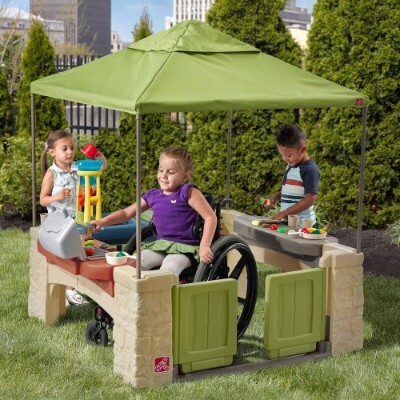 Playset with multiple items to climb on, slide down, and move about on, giving them a great opportunity to advance their gross-motor-skill development. The balancing act on the ladder, the coordination used on the swing, and moving about the playhouse provide a great opportunity to work those gross-motor skills. 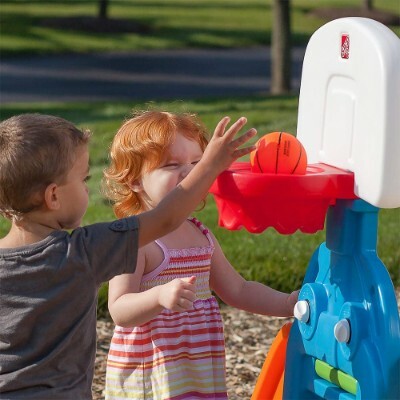 Kids can play in constant shade because of the canopy top with this product. It is important that children have somewhere to go out of the harmful sun rays on beautiful, sunny days. 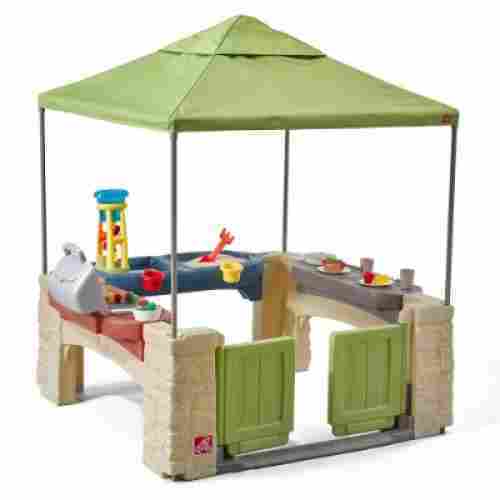 This outdoor playset features plenty of activities for kids aged two to eight. 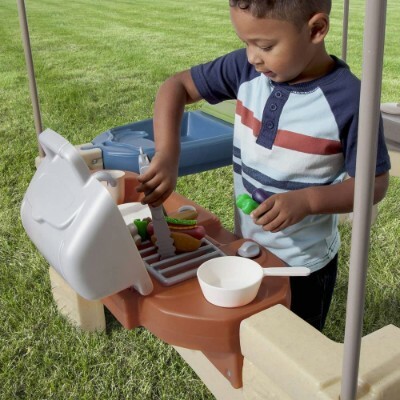 It includes a grill, water tower, swivel faucet, dish set, snack table, and a sink. Play foods also come with this toy that has a high canopy for great air circulation. There is plenty of room for several kids inside the canopy that will fit into most any backyard décor and design. The two compartments in the table sections are for sand and water activities, and covers are included for both the pit and the sink. 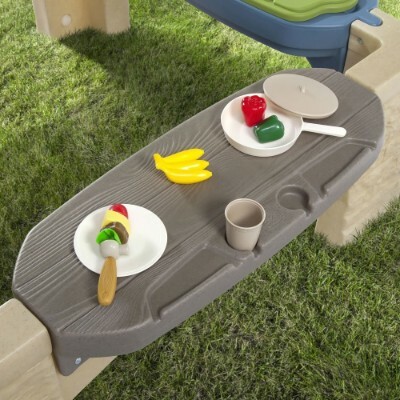 The play food that comes with this playset really makes it stand out as a wonderful activity center for kids. They can serve up plates of goodies after they have grilled the items. 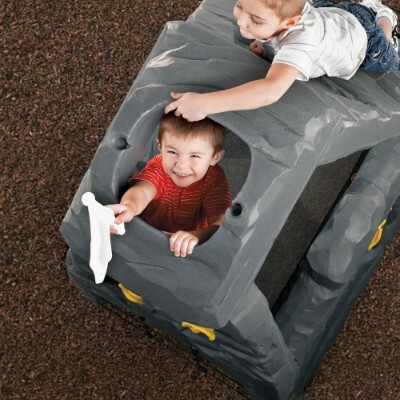 This made in the U.S.A item encourages role play, interactive activities, and social skills. Gross and fine motor skills will also be exercised with the preparing, washing, cooking, and serving of the play foods. Assembly is required, but easy-to-follow instructions are included. The open design of the canopy and benches make this a wonderful play area for kids that are in wheelchairs too. 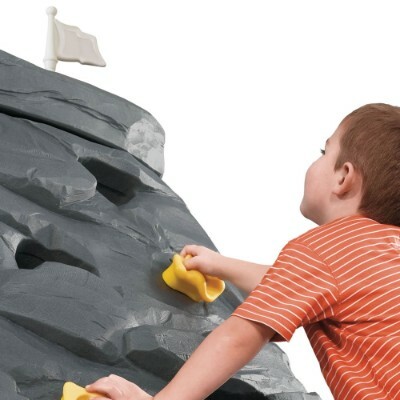 If you have a kid who is fascinated about climbing Mt. Everest or simply loves to use those small limbs to scale or climb, then you really need to get the Skyward Summit from Step2. 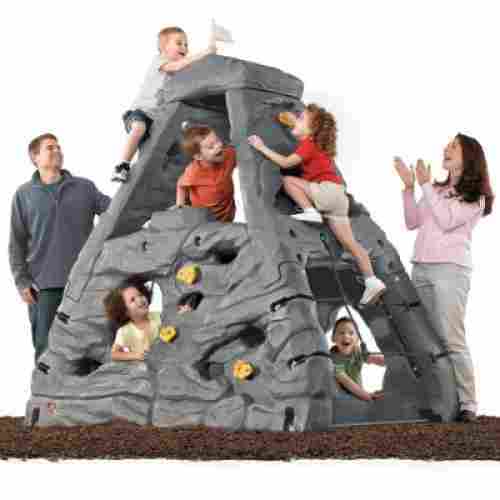 This replica of a mountain has 4 climbing surfaces that feature different obstacles to help stimulate your kid’s problem-solving skills and spatial intelligence. The different climbing surfaces allow for creativity, imagination, logical thinking, and problem-solving. These traits are something that every parent would want to see from their children. 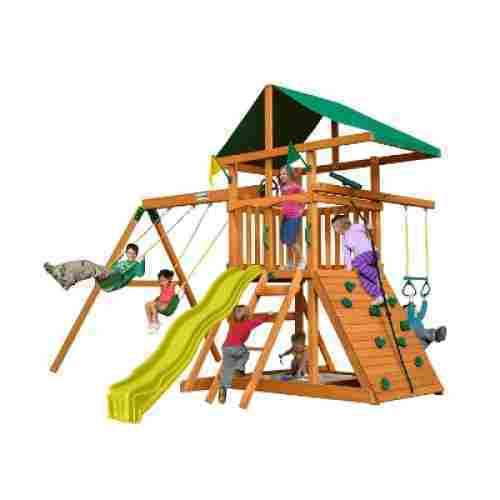 The mountain playset can accommodate up to 4 children at a time, one on each climbing surface. 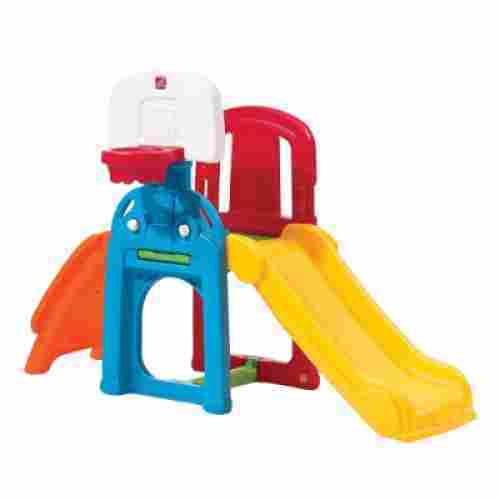 The playset features a floor net, 2 climbing cargo nets, and 9 colorful hand grips. There is a flag at the summit so it can be a real climbing race to the top. Your child’s hand-eye coordination will improve as they work to grab each rock. All four of the unique climbing sides will increase your child’s fine motor skills. The flag at the top will increase your child’s confidence levels as they climb the top to reach it. Furthermore, it will help them develop a healthy sense of competition as they race against their friends to be the first one to touch the flag. 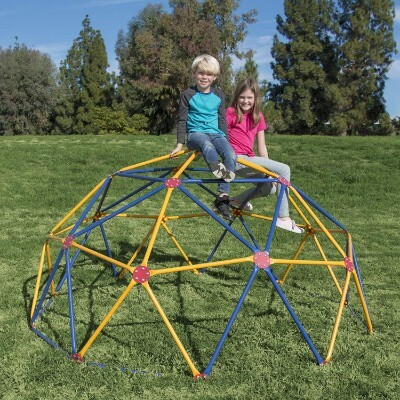 Imagine a hemisphere composed of bars configured in triangular shapes and you have the Space Dome Climber, a modified climbing and monkey bar playset designed primarily to help strengthen the arms and legs of kids. This playset is constructed of high grade and heavy duty steel bars that have been powder-coated to withstand corrosion as well as provide all-around weather protection including UV radiation. It can accommodate up to 1,000 pounds of the total combined weight of children. The bars are finished in different colors to help reinforce color recognition and mastery. With a diameter of about 7.5 feet, this should fit well into the backyard of almost every other home. What is amazing about the product is its ability to help stimulate kids’ agility, balance, and self-confidence. 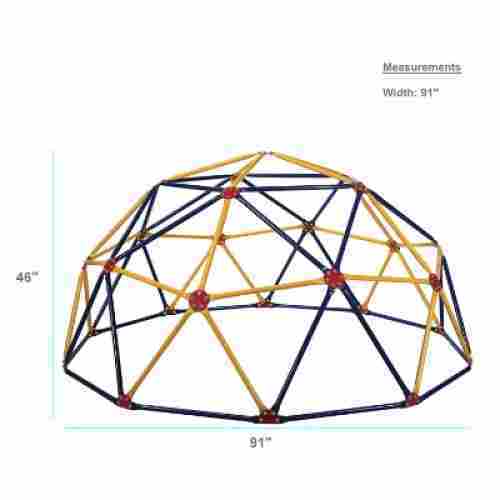 With a diameter of seven and a half feet this toy, while space consuming, will also provide children with ample space to climb. 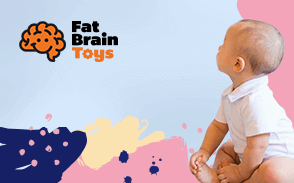 In addition to muscle development, this toy stimulates the development of gross motor skills. Physical development will be enhanced by improving agility and balance. 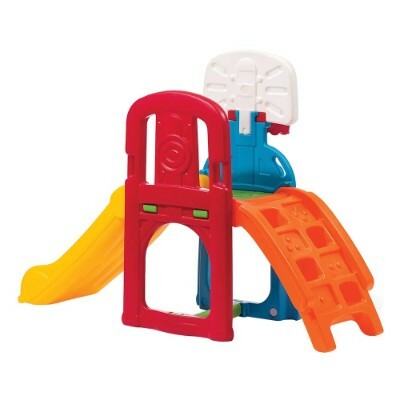 Designed for ages three to ten years old this toy is a great pick for a spacious back yard. Often children need to be encouraged to play outside, especially in this age of computer games and activities. This roller coaster will get them outside to enjoy the sun and fresh air while having loads of fun on the ramp. Everyone loves roller coasters, but sometimes small kids are scared of their size and speed. This is the perfect solution that can be used all the time because it is just the right size and speed for your little one. The car’s safety features include handgrips, a high back for the seat, and footrests. The car is easy to get into, and it provides a smooth, balanced ride down the track. 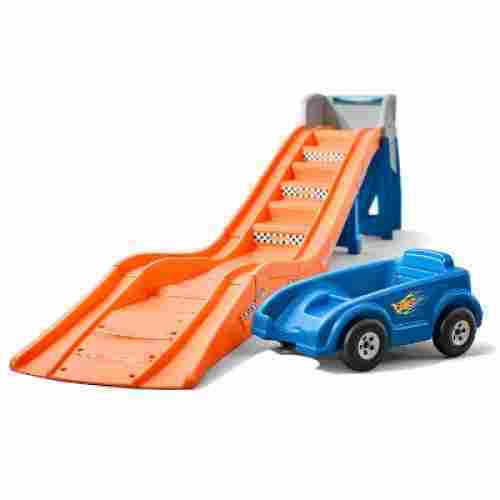 It features an extra-long ramp for an enhanced ride with its sturdy and long-lasting construction. The toy has steps going up the ramp so kids can climb up pushing the car and then ride down the ramp. Colorful and exciting ride, it is ideal for kids three and older who weigh less than 75 pounds. This item can be used alone or with an older person moving the car up the ramp for added safety. 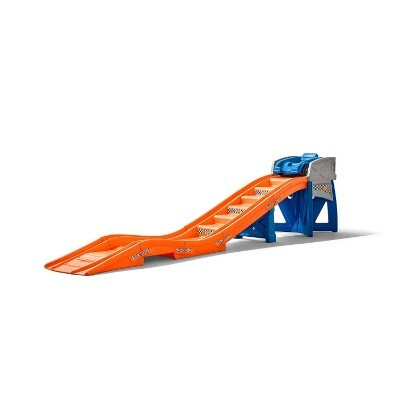 Bring the excitement of an amusement park to your yard with this fantastic Hot Wheels Coaster Ride. Develop your child’s motors skills with this fabulous coaster ride. When kids push the car up the ramp, they will be exercising all of their muscles to get the ride to the top of the ramp. Has a low roof, may not suitable for tall children. Steep ladder, requires excellent coordination skills and some adult supervision. What do you get when you combine a sturdy lookout watchtower and a beautiful slide? A Naturally Playful Lookout Treehouse, that’s what. 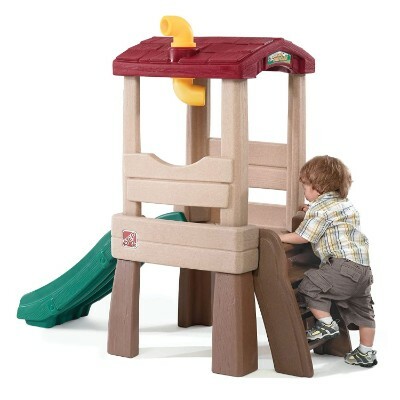 This playset has a 19-inch high watchtower platform accessible via a 3-step ladder and egressed via a 33-inch slide. This is perfect for helping very young children develop their gross motor skills and balance while still having a really great and fun time. As your little one works to get up the ladder they will be strengthening the muscles in their legs and arms. The “shingled” roof provides shade so your child can enjoy their playset on even the hottest summer days. The 180-degree rotating periscope will encourage your child to get creative and use their imagination. All components are made of solid plastic giving it strength and durability. The assembly is very easy and the overall dimension of the playset can fit right into your living room or your kid’s playroom. This means your kid will still be playing on it even if it’s raining outside. 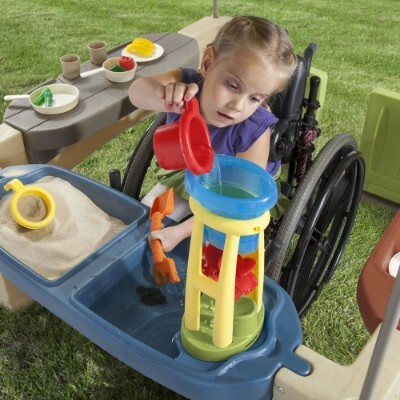 There is so much to do with this playset for toddlers to develop their gross motor skills. Kids can shoot hoops, climb the ladder, kick a goal, and swish down the slide. 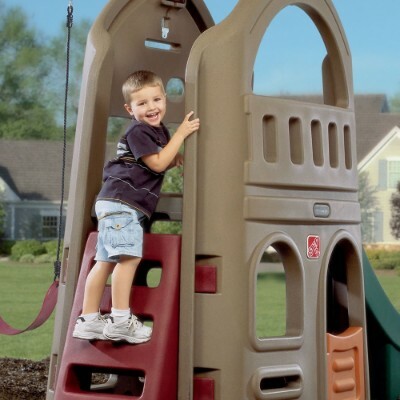 This sports climber comes with a sturdy and smooth slide, a basketball hoop, and a gently curved climbing ladder. We love the fact that the playset is multifunctional as several kids can play at any given time. This is perfect for group play. It can also serve to stimulate children’s creativity by providing them with the different structural features for a variety of purposes. The Game time Sports Climber is a multipurpose playset that can really stimulate kids’ motor skills and imagination. The structure can also serve as a soccer goal, a crawl-through tunnel, or a toss-through wall perfect for helping develop precision and hand-eye coordination among children. It has a weight limit of about 60 pounds. Safety was at the top of the list of priorities when compiling this article. Next in line was functionality. These companies have well-known and popular reputations among entertainment and supplies for children. They ensure their products are made of safe and non-toxic materials. 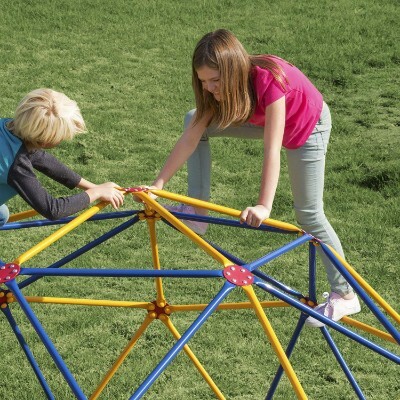 These outdoor playsets provide your child with some irreplaceable benefits. The release of energy will stimulate focus and promote better sleep for your child. These sets provide activities to engage your children to improve a range of skills. Coordination, balance, and agility are enhanced. While also strengthening muscles, such as core, arms, and legs. Hand-eye coordination, reflexes and motor skills (both gross and fine) are strengthened, providing many developmental benefits. Watching a child’s face light up and listening to their laughter as they are immersed in the world of imagination is one of the best feelings you can experience. Creative play and pretend are fostered by the items on this list. Your children will be inspired by the adorable and colorful design of these playsets. Self-confidence will be developed as your children physically pushes themselves to swing higher, run faster and go one step further on the rock walls. These toys provide a variety of activities to keep your child intrigued and active for hours of memorable fun! It is vital to a healthy brain and muscle development to spend time outside. Physical activity is important to keep kids fit and promote healthy habits as they grow. Fresh air is good for you and the sun provides you with vitamins and nutrients. Being outdoors exposes you to simple science concepts. With so many distractions out there it can be a real challenge to get your little one excited about being outside. 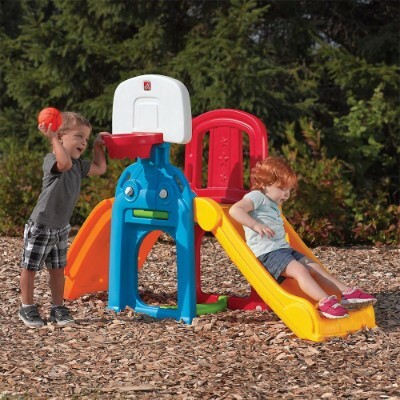 These great playsets will assist you in providing your child with a thrilling incentive to get out and get moving. There are many benefits to playing outdoors. Children have the freedom to run, jump, shout, skip or hop all they want. Outdoor play helps them use their entire body to help develop their motor skills. Wide open spaces challenge children to become more physically active which can lead to the development of healthier habits which they can use when they grow up. The fresh air and sunshine children get from playing outdoors can also help them sleep better at night. More importantly, playing outdoors is one great opportunity for your kids to interact with other children to help them develop their social skills. There are plenty of benefits of playing outdoors and you can support your children during their play. Socialization is an important skill to develop. This development is helpful for attending school and learning to work well with others. This will be helpful in a work environment as well as college and those awkward teenage years. Introducing your child to the concept of teamwork, these fun playsets are ideal for inspiring your little ones to include new friends, siblings and old friends, improving and strengthening confidence and trust in others. q: How big are these playsets? They range in size so there is something for everyone, even if you have limited space to work with. q: How many kids can play at one time? The majority of these sets are designed with your child’s social life in mind. This means all of these products will support two children at the very least. However, most support an average of four children at a time. q: What is the age range for these toys? The majority of the products’ age ranges average about 4 to 6 years old. There are a few products on here that are suitable for children a bit older, even a couple available for younger children. There are products appropriate for ages, from 2 all the way to 15.
q: Does everything come included in these sets? Yes these sets do come complete. There are additional accessories that can be purchased separately but not necessary as most of these provide so much stimulation your child won’t feel as though they are missing out on anything. q: Is assembly a hassle? There are several reviews that state assembly was a breeze. Some admit to a time-consuming experience but there are instructions included for assembling these sets. q: Is there a warranty for these products? The majority of manufactures on this list offer their own warranty options. In addition, the company responsible for shipping your product may also have a separate warranty policy.